The Open Call is now closed! The Open Call is now closed. Thank you for your application! The Eyebeam Residency is a prestigious award for artists engaged with technology and technologists working in the arts. Residents work in Eyebeam studios in Brooklyn for one year on experimental, interdisciplinary projects with a goal towards invention and impact. Residents receive a generous financial stipend as well as access to top-notch facilities and a dynamic far-reaching community. Frequent critiques and mentorship by field leaders in the arts, business, and technology sectors round out the experience. Work generated by artists during their residency from October 2017 to September 2018—whether art, research, code, or machines—are to be made open source and accessible to the public through means like teaching tools, open events, public repositories and documentation. The ways in which we trust have been transformed. As institutions lose credibility, people are placing their faith in new myths. Multiple publics are in constant negotiation and agitation. It is critical to design methods for critique, communication and coordination towards a more open, inventive and just world. Democracy: How can technology be leveraged to strengthen democratic values? 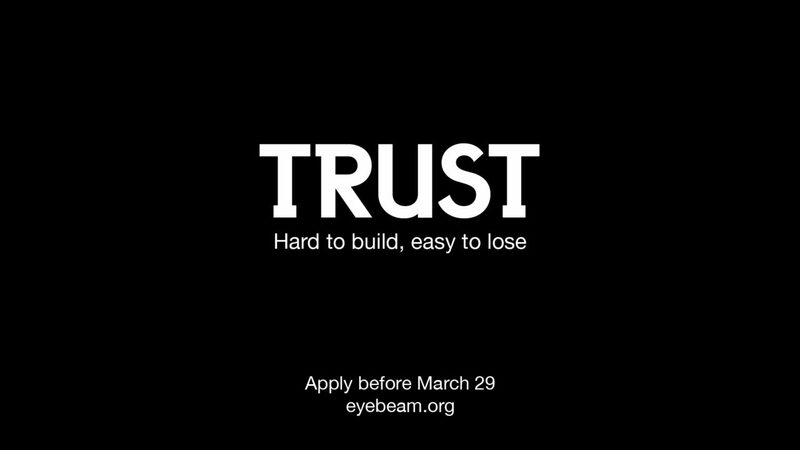 As the nature of fact changes, Eyebeam aims to support decentralized systems and alternative social and media networks for more robust civic engagement. Ownership: How do we expand open-source practice in service of the commons? As inequality grows, Eyebeam aims to support the creation of radical tools for the redistribution and reparation of wealth, land and culture. Community: How can communities acknowledge differences while building unity? As prejudices continue to divide us, Eyebeam aims to support the invention of mechanisms that encourage accountability and solidarity. Collectives and collaboratives can apply, but a single person (21 years or older) will be responsible for committing as a resident for the year, and be the point person for communications and payments. Your work samples should reflect a history of working together. International applicants are welcome. On acceptance, the applicant is responsible for securing a visa to the USA; Eyebeam will furnish supporting letters and documentation. This call is open to engineers and artists who want to work within a collaborative environment for critique and support. There is no required skillset, but you must be able to learn the skills you need to produce on your own. Acceptance into the program is predicated upon applicant’s ability to commit to 3 days a week of robust professional development and group feedback participation from Tuesday through Thursday. Success of the group program is dependent on you being present regularly. Commitment: Acceptance into the program is predicated upon applicant’s ability to commit to 3 days a week of robust professional development and group feedback participation from Tuesday through Thursday. Success of the group program is dependent on you being present regularly. No late applications can be accepted. In person interviews will take place in early June. Applicants will be notified in early July. Alignment with Eyebeam’s values. Openness: All the work here is driven by an open-source ethos. Invention: We build on old ideas to generate new possibilities. Justice: Technology by artists is a step towards equality and democracy. Residency Director Laura Welzenbach will be holding a livestreamed discussion of questions and answers about the Open Call for resident applicants. Follow Eyebeam’s Facebook here to watch it. The video will be archived for viewers. She will be taking questions from comments on Facebook and Twitter. Check out the FAQ for more information. Still have questions? Email [email protected].